Immaculata High School is committed to the development of the whole person within the framework of Catholic traditions and values. Guided by the pillars of Faith, Scholarship, Service and Friendship, Immaculata integrates a challenging academic curriculum that promotes spiritual, intellectual, physical, emotional and social growth while fostering moral responsibility to self and others. In loving obedience to Jesus Christ and His command to preach the Gospel to all people, Immaculata, a Roman Catholic parish high school of the Diocese of Metuchen, promotes and offers an environment of learning and mutual respect, where faith, integrity, and Christian ethics serve as the moral guide of daily life. Immaculata presents the opportunity for its students to experience a personal relationship with Jesus Christ while preparing them for a technologically progressive culture and a changing world. The administration and faculty, with the support of parents and guardians, provide a challenging academic program, rooted in the Gospel message of Jesus Christ, as cherished in the traditions and teachings of the Catholic Church. The formation of the whole person and the uniqueness of each individual are developed through activities that promote spiritual, intellectual, physical, emotional and social growth.The Immaculata High School community motivates its students to live prayerfully, morally, and productively as they take active roles in the present and future of our Church, our country, and our world. For years, Immaculate Conception Church's pastor, Rev. Robert Graham, worked with his parishioners to establish a Catholic grammar school in Somerville. After his death, a new pastor, Father Eugene B. Kelly, a dynamic ex-Marine Chaplain, carried forth this dream. With the guidance and assistance of the Sisters, Servants of the Immaculate Heart of Mary (IHM) and the people of Immaculate Conception Parish, Father Kelly opened the doors of Immaculate Conception School (ICS) in 1957 with grades one through four. However, Father Kelly had a bigger vision. He wanted a Catholic high school for the first graduates of ICS. So again, with prayers, hard work, and an enormous commitment from the parish and the IHM community, Immaculata High School was born. Father Kelly selected the motto: "Unitas Caritas" (Unity and Charity) and this concept permeates every aspect of life at Immaculata. The first classes for Immaculata were held at ICS with just 90 freshmen. 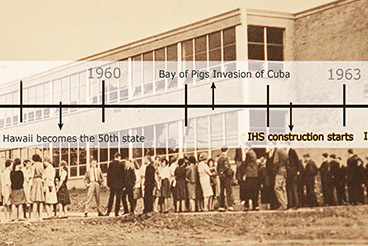 Then in 1963, the high school building was finished and the doors opened to 215 freshmen and sophomores. The staff consisted of nine sisters and two lay teachers. What Monsignor Kelly established so many years ago, was not just a school, but a family. Over the years, the Immaculata family has grown tremendously. Each year we welcome new students, some being a second generation to enter these halls. Immaculata students enter this school as strangers, but they leave a family. Our school community provides outstanding education and an environment that fosters the realization of students' full potential as people, as students and as Catholic Christians. Over 8,000 graduates from over 60 parishes and towns have walked these halls. A majority of them stay connected to Immaculata through the alumni office, news letters, events, reunions, teaching and coaching opportunities. He was a war hero. He was a pillar of faith. He was Father Eugene Kelly, the courageous man who time and again overcame fear and adversity, and eventually spearheaded the construction of Immaculata High School. Ordained in 1937, Father Kelly spent the first six years of his priesthood in two different churches before making a heroic decision-he joined the Navy Chaplain Corps … and ended up among the very first wave of soldiers to hit the deadly beaches of Okinawa in April, 1945. As a chaplain, Father Kelly had the option of staying safely behind at the aid station, but he instead chose to accompany his men to the front lines. He followed his men into battle on a daily basis, because he knew many of those wounded at the front wouldn't survive the trip back to the aid station and would die without receiving the sacraments. For his courage under fire, Father Kelly was awarded a pair of battle stars. Even before he was ordained, Father Kelly's life was anything but ordinary. Born in Brooklyn in 1910, he, like many future priests, served as an altar boy. However, at a time when the altar server's responsibilities were rather more complicated than they are today, he was fired from his position for incompetence. Ironically, he always said this incident truly began his love of the Church. 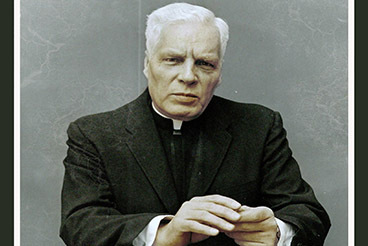 After World War II, Father Kelly moved through several parish assignments before being appointed pastor of Immaculate Conception in April 1956. His first order of business was managing completion of Immaculate Conception parish's grammar school, a labor of love begun by Father Robert Graham. The grammar school's door finally opened to students on September 4, 1957, and Father Kelly immediately started work on his own dream-opening a parish high school. "By sheer strength of will, Monsignor Kelly was able to complete a dream that began two pastors before him," says Monsignor Seamus Brennan, pastor of Immaculate Conception parish and director of Immaculata High School. "Those who knew him described him as a visionary. Through thick and thin, Monsignor Kelly, who was honored with the title of Monsignor by Pope Paul VI in 1967 and who passed away in 1985, never faltered and he was duly rewarded when Immaculata High School welcomed its first students in 1963 in its new building." Seven years later, on June 10, 1970, Immaculata High School graduated a very special class of students. Of the 160 young men and women receiving diplomas, 28 made up the first group to complete its entire education-from kindergarten through their senior year-in the parish's two schools, putting a final flourish on Monsignor Kelly's vision of making a comprehensive Catholic education available to all Immaculate Conception's children. "Parents sent their children to Immaculata because of Monsignor Kelly," says Frank Quinn, who graduated from Immaculata High School in 1966. "They felt that Monsignor Kelly was a shaper of young people, a man whose strength would help students develop character by following his example. Even though he knew the paths he chose in his life wouldn't be easy, he knew his challenges would be worth it in the end." A man of intense moral strength and fortitude, Monsignor Kelly also had a humorous and approachable side. One student, Dorothy Gordon, Immaculata High School graduating class of 1967, fondly remembers how Monsignor calmed her fears during a time of sadness in her young life. "When I was a freshman, my grandmother passed and I was away during exam time," says Gordon. "Upon my return to school, my fellow classmates wanted to help me pass my exams and shared the questions with me. I felt very guilty about this and went to confession with Monsignor Kelly. I told him that I felt I had cheated and instead of making me feel worse, he said, ‘I know you would have passed the exams anyway. Now, Dorothy, you can go back to class!' Along with his strength, I will always remember his compassion." After five decades, it's to be expected that folks will take a particular building for granted. It's just a natural offshoot of familiarity, despite how many obstacles had to be overcome, and how many challenges need to be faced to make the structure rise. But the construction of Immaculata High School was truly special and absolutely worth remembering. The story begins way back in 1957-in the days of the Eisenhower administration, Sputnik, and Elvis Presley-when many Catholic parishes had their own grammar schools but precious few had their own high school. Monsignor Eugene Kelly, pastor of Immaculate Conception Church, had just directed completion of construction on Immaculate Conception's new grammar school. It was a significant accomplishment … but Monsignor Kelly had even more in mind for his church's young people. He was planning a parochial high school but he knew he couldn't do it without the help of his parish. "He knew there would be serious challenges related to building a parish high school, particularly in terms of costs … but Monsignor Kelly had a dream," explains Monsignor Seamus Brennan, pastor of Immaculate Conception parish and director of Immaculata High School. "And what's particularly compelling is that he had unwavering confidence in his parishioners. He believed they would overcome any obstacle that arose to provide their children with the best possible Catholic education. And under his leadership the people of this parish responded generously and sacrificed so their children and future generations could reap the benefit of a Spartan education." Immaculata High School had many benefactors-parishioners who had recently donated towards the construction of the grammar school but nonetheless, contributed what they could for the high school's construction. Five hard years of confronting and solving problems followed, but on May 20, 1962, Monsignor Kelly's dream finally began to take solid form as the parish broke ground for what would be the first parochial high school in the history of Somerset County. The new building itself wasn't ready that September … but that didn't stop an initial class of 90 freshman students from beginning their high school studies in the grammar school. "Monsignor Kelly was a wonderful guy," says Mike McGee, the architect who worked with Monsignor Kelly to create Immaculata High School. "He knew exactly what he wanted and asked lots of questions. To keep costs down, when I came in from Ohio and visited the construction site, I stayed in the rectory instead of a hotel. Monsignor Kelly even brought my family to New York for a full tour during one visit. He loved life in all its forms and he wanted to share it." At last, in September 1963, Immaculata High School opened its doors for the first time, admitting a total of 215 freshmen and sophomores, along with a staff of nine nuns and two lay teachers. For the Immaculate Conception Parish, it was a dream come true.